When you encounter a plumbing problem with your home or business, there are few things that can be more stressful. Water damage can be devastating to your property and take a long time and a lot of money to repair the problems. When it comes to your home's plumbing systems, the longer you wait, the more extensive the damage can become. At EZ Flow Plumbing, LLC, we have the skills, resources, and ability to provide you with reliable plumbing repairs and installations. Our licensed Gilbert plumbers are not only focused on providing you with our exceptional technical skills but with industry-leading customer service. As an established plumbing company, countless customers have trusted us to take care of their home's needs promptly and efficiently. Our team is dedicated to helping customers throughout the Mesa, Chandler, and Gilbert areas with all of their plumbing needs. We are proud to have earned a reputation with our customers and neighbors for providing friendly, expert service for a wide range of plumbing issues. 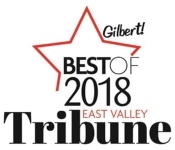 We have even been awarded Gilbert's Best of 2018 Award by the East Valley Tribune. When you trust our team to provide you with plumbing services, we arrive on time, work on schedule, and protect your floors and surfaces. Schedule your free upfront consultation with our team at EZ Flow Plumbing, LLC by calling (480) 351-1820 or filling out our contact form. See How EZ Flow Can Help! Expires Sep 30, 2019 150 Whole House Filtration System! Expires Sep 1, 2019 15 Drain Cleaning! Expires Sep 30, 2019 75 Water Softeners! Expires Sep 30, 2019 30 Fixture Replacements! Expires Sep 30, 2019 75 Water Heaters!